Grand prize in the Virginia Institute of Marine Science’s annual Marine Science Day artwork contest goes to Michelle-Marie Scott, a university administrator in Utah, for her line drawing of a very noisy oyster toadfish. The always-popular contest—based on the changing theme of VIMS’ annual open house—has inspired artists young and old with other challenging subjects over the years, from sand to oysters to seahorses, but this year’s theme—Sounds of the Sea—may have been the most difficult. Susan Maples, Director of Outreach at VIMS, says the contest judges “really liked Michelle’s drawing because of the way it combined artistry with the technical aspect of the sonogram.” Sonograms, also known as spectrograms, are visual representations of the spectrum of frequencies in a sound or other signal. 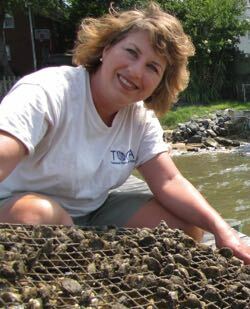 Oyster “toads” are an abundant year-round resident of Chesapeake Bay, and—as their name implies—play an important role in the Bay’s oyster-reef food web. They eat both oysters and blue crabs with their broad crushing teeth, and are the fish most likely to be trapped in derelict or “ghost” crab pots. They themselves are also edible, but of little interest to anglers because of their looks, with the bulging eyes and fleshy whiskers that only a mother oyster toad could love. 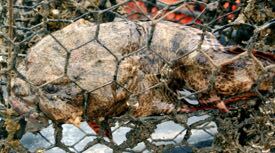 It might not be an accident that male toadfish depend on their call to attract females! 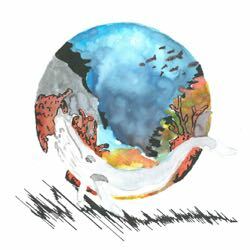 Scott’s Grand Prize artwork will be used in advertisements and featured on the official 2016 VIMS Marine Science Day T-shirt, with limited numbers of these on sale in the VIMS Gift Shop during the event. VIMS is still accepting votes for its “People’s Choice Awards,” a separate category of the Marine Science Day art contest. 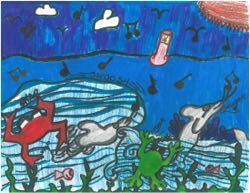 The kid’s and adult artwork that receives the most "likes" on the VIMS Facebook page between now and May 4th will be recognized along with Scott and other contest winners during the Marine Science Day awards ceremony on Saturday, May 21st. Maples says her group chose “Sounds of the Sea” as this year’s Marine Science Day theme because they are both fascinating and a topic of growing research interest at VIMS and elsewhere, as marine scientists increasingly recognize their importance. In addition to oyster toads, the Bay is home to several other species that use “bioacoustics” for finding mates, locating prey, or general communication, including Atlantic croaker, spotted seatrout, black and red drum, mantis shrimp, and dolphins.